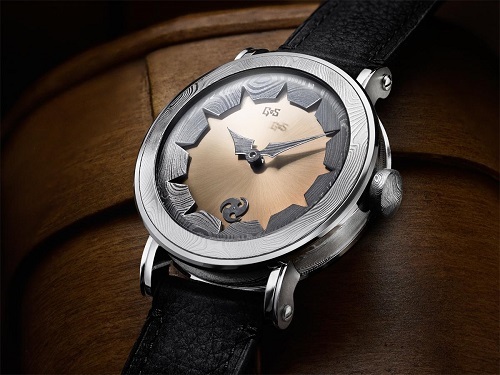 GoS Watches, the creators of the exquisite Nordic Seasons Collection have a new addition to their portfolio - the GoS Midnight Sun Limited Edition watch, and this time the view through the caseback is almost as eye-pleasing as the dial-side panorama. GoS pieces are inspired by the essentia of the Swedish landscapes and culture and the GoS Midnight Sun piece is evocative of the gentle, golden sun which almost never sets during an Arctic summer. Replicating such a diorama required the use of a solid gold dial with layer upon layer of radial finishing in order to achieve the sunray effect. The abstract shape of the sun is captiviated by the unexpected profile which has been carved into the Damascus Steel chapter ring, which provides a striking contrast to the silky smoothness of the golden dial. For the GoS Midnight Sun piece, Patrik Sjögren has employed the skills of Jochen Benzinger, who uses his expertise in skeletonisation to produce a stunning labyrinth of spiky sunrays which compliment the theme of this watch to great effect. Beginning with a Swiss Manual ETA 6498 calibre, which has been improved to Chronometer standards by Soprod, Jochen has transformed the ordinary into something extraordinarily beautiful. Master Bladesmith Johan Gustafsson and Master Watchmaker Patrik Sjögren met in 2007 and, with shared enthusiasm began to combine their skills. Their portfolio is characterised by the use of Damascus Steel, through the ages the bladesmith’s friend. The perfect material for weaponry also lends itself to watchmaking and using traditional handforging techniques Johan produces patterns which convey Patrik’s designs. The talents of both craftsmen combine with such empathy that the marriage of their skills is not simply wholly compatible, it is one which produces timepieces of unmitigated beauty. The GoS Midnight Sun will be limited to just 5 pieces. My introduction to GoS Watches.